BEAVER DAM, Wis. - June 25, 2016 - Hartland, Wis. -native Bill Balog outdueled 2013 World of Outlaws Craftsman Sprint Car Series champion Daryn Pittman early, then held him off on a final green-white-checkered finish to capture his first series victory in the Jim "JB" Boyd Memorial presented by Karavan Trailers at Beaver Dam Raceway on Saturday night. Balog, who is only the fifth non-Outlaw driver to win in 2016, captured the lead from Pittman on lap three after starting the feature in the second position. "Now I feel like I have a home track advantage," Balog said as the Wisconsin fans cheered. "We have won a few here, but not really dominating wins. I got a lot of Wisconsin people here behind me, so I got to thank all of you guys. "Maybe they didn't think we could do it, but we did it and it's an awesome, awesome night." Pittman, who was victorious in a green-white-checkered finish on Friday night at Jackson Motorplex, tried everything possible to muscle the victory away from Balog, but came up one spot short of claiming back-to-back victories. "I gave everything I had," Pittman said. "I had it all planned out perfectly in my head, but it didn't go that way. Nothing went the way I thought; we had that red flag, and I think my tire went down a little bit...think if my tire was low enough, I probably could've stuck it, because after the checkered I hit it really good down there, but too little, too late. "Congrats to Bill and his team, they did a great job and he ran a great race, so they deserve to win. I just needed to make some better decisions and get to the top of the track quicker and hang on to the lead a little longer." The night kicked-off with Joey Saldana picking up his 10th quick-time award of the season, when he paced qualifying with a lap of 11.895 seconds. Saldana continued to flash speed early as he accompanied Jason Johnson and David Gravel as heat race winners in the dash. The dash inversion draw was not Saldana's friend, as a complete inversion of the six-car field placed Saldana at the rear and put Balog on the pole position. Balog, in the Buesser Concrete/Extreme Stainless No. 17B, could not capitalize on the lucky break, as he lost the lead early to Pittman, who started the six-lap race in the third spot. Pittman easily scored the dash victory, which placed him on the pole position for the 40-lap feature. As soon as the green flag dropped for the feature, Pittman, in the Great Clips/Sage Fruit No. 9, jumped out to an early lead on Balog. Pittman held on to the top spot for the opening two laps, but Balog charged his way back to the front of the field and retook the lead on lap three. The race began with a 23-lap green flag run which allowed Balog to extend his lead on Pittman as the two battled through lapped traffic. Pittman kept within striking distance of the leader, before a caution with 17 to-go hampered his plans. 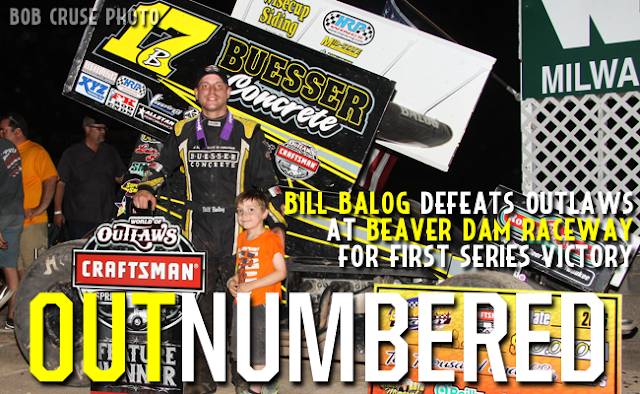 When the green flag came back out, Balog again escaped the grip of the World of Outlaws regulars, as Pittman suddenly fell victim to a red-hot David Gravel, who started in the third position and remained there through most of the race. Gravel slid in front of Pittman for second before turning his attention to the leader. Gravel appeared to have the faster car as he tried the infamous dirt track slide-job for the lead, but came up just short as Balog again pulled away from the field. The caution was displayed again with 10 laps to go, as Brad Sweet, who currently sits second in the championship standings and was running the top five, suffered a mechanical problem and had to take his car to the work area. Sweet later returned, but finished in the 19th position. On the ensuing restart, Pittman worked his way back around Gravel for the second, but still did not have enough speed to catch the leader. While the top three remained glued bumper-to-bumper, a familiar face lurked just behind them. Seven-time series champion Donny Schatz, in the Bad Boy Off Road/Chevrolet Performance No. 15, charged his way from the 14th starting position to crack the top five with just five laps remaining. Schatz appeared to be peaking too late as the had a sizeable deficit to overcome to contend for the win, but a final caution on the white-flag lap changed the outlook of the race. Balog restarted the race ahead of 2013 series champion Pittman, 1996 Kevin Gobrecht Rookie of the Year Joey Saldana and seven-time series champion Schatz, who have combined to win 19 races this season. Over the final two laps, Saldana and Schatz battled hard for the third position while Pittman tried everything possible to disrupt Balog and steal the victory. In the end, the local driver kept his car glued on the outside line, which prevented Pittman from building up enough momentum to clear him for the lead. Balog held on to the lead and defeated the World of Outlaws to score the victory in his home state of Wisconsin. "What a race, I have to thank everybody that helped me out," Balog said. "It's a really good feeling - we were in a similar position a couple of years ago and kind of gave it away, so I wanted to make sure that didn't happen again. "We could restart really well off of the bottom, so I knew if I could just get up to the cushion and beat the slide job - I didn't know if Daryn [Pittman] was running the bottom or not. [The Outlaws] are the best of the best, so it's a pleasure to race with them really." Pittman held off Schatz for the runner-up position, as he picked up his 17th podium finish of the 2016 season. "I had a plan thinking [Balog] might slide himself, or short slide himself and cheat his entry into one and I was just going to try to hit as good a lap around the top," Pittman added. "I was killing him off of four on the bottom, so if I could get close enough off of two then I could get him. He ended up having a good two or three car lengths on me off of two and there wasn't enough time to get back to him. "I had a good run going there and tried to pull the slider too early, with probably five or six to go, and then lost a lot of ground, but made it back up. It was a good effort, but I'm frustrated to run second." Schatz, who finished sixth on Friday night at Jackson Motorplex, rebounded for his eighth top-three finish in the month of June and 18th of the season. "Tony Stewart's guys are awesome at what they do," Schatz said. "The way the races play out, our cars just get better and better. Great job to be able to come through there and it was a respectable finish, but I think the two cars in front of us were a little better. "You never know, the race tracks change and sometimes they change towards you and sometimes they change against you. I don't know if it went either way for us but we were lucky to pick up the spots that we did." The World of Outlaws Craftsman Sprint Car Series will invade the newly dirt renovated Rockford Speedway for the first ever Outlaw Clay Classic on Wednesday, June 29. For more race information and ticket purchasing options, visit: www.WoOSprint.com/Rockford-Speedway. RACE NOTES: Bill Balog captured his first career World of Outlaws victory...Joey Saldana claimed his series-leading 10th quick-time award of the season with a lap of 11.895 seconds...Daryn Pittman continues to lead the series in feature pole positions, after he scored his 10th of the season tonight. CONTINGENCY WINNERS - MSD Ignitions ($25 cash): Russell Borland; MSD Ignitions ($50 cash): Daryn Pittman; Penske Shocks ($50 cash): Donny Schatz; JE Pistons ($50 cash): Shane Stewart; VP Racing Fuels ($50 cash): Kerry Madsen; Edelbrock ($50 cash): Jacob Allen; Comp Cams ($50 cash): Jason Sides; Morton Buildings ($50 cash): Paul McMahan; Cometic Gasket ($50 cash): Paul Nienhiser; Super Flow ($50 cash): Scott Thiel; Craftsman/Sears ($100 cash): Bill Balog; KSE Racing Products ($100 product certificate): Donny Schatz; Comp Cams ($50 product certificate): Daryn Pittman; JE Pistons (Set of Rings): Russell Borland; JE Pistons (Set of Rings): Scotty Neitzel. SEASON WINNERS: Donny Schatz - 10 (Volusia Speedway Park on Feb. 14, The Dirt Track at Las Vegas on March 4, Stockton Dirt Track on March 18, Stockton Dirt Track on March 19, Silver Dollar Speedway on April 2, Lincoln Speedway on May 19, Weedsport Speedway on May 22, Lincoln Park Speedway on June 8, Knoxville Raceway on June 11, River Cities Speedway on June 17); Brad Sweet - 6 (Volusia Speedway Park on Feb. 13, Volusia Speedway Park on Feb. 14, Cotton Bowl Speedway on Feb. 26, Ocean Speedway on April 1, Bakersfield Speedway on April 15, Plymouth Speedway on May 13); Daryn Pittman - 5 (Royal Purple Raceway on Feb. 27, Perris Auto Speedway on April 16, USA Raceway on April 18, New Egypt Speedway on May 24, Jackson Motorplex on June 24); Shane Stewart - 5 (Arizona Speedway on March 6, Devil's Bowl Speedway on April 23, Lawrenceburg Speedway on May 30, Granite City Speedway on June 15, Brown County Speedway on June 19); Joey Saldana - 4 (The Dirt Track at Las Vegas on March 3, Devil's Bowl Speedway on April 22, Jacksonville Speedway on May 4, I-80 Speedway on June 22);David Gravel - 3 (Thunderbowl Raceway on March 12, Tri-State Speedway on May 14, I-96 Speedway on June 6); Kerry Madsen - 2 (Eldora Speedway on May 6 and 7); Bill Balog - 1 (Beaver Dam Raceway on June 25); Lance Dewease - 1 (Williams Grove Speedway on May 20); Chad Kemenah - 1 (Fremont Speedway on June 3); Jason Johnson - 1 (Placerville Speedway on March 24); Terry McCarl - 1 (Knoxville Raceway on June 10);Jason Sides - 1 (I-30 Speedway on April 26); Greg Wilson - 1 (The Dirt Track at Charlotte on May 27). World of Outlaws Craftsman® Sprint Car Series Statistical Report; Beaver Dam Raceway; Beaver Dam, Wis.; June 25, 2016. A-Main - (40 Laps) - 1. 17B-Bill Balog [$10,000]; 2. 9-Daryn Pittman [$5,500]; 3. 15-Donny Schatz [$3,200]; 4. 83-Joey Saldana [$2,800]; 5. 5-David Gravel [$2,500]; 6. 2-Shane Stewart [$2,300]; 7. 1S-Logan Schuchart [$2,200]; 8. 29-Kerry Madsen [$2,100]; 9. 1A-Jacob Allen [$2,050]; 10. 7S-Jason Sides [$2,000]; 11. 7-Paul McMahan [$1,500]; 12. 9X-Paul Nienhiser [$1,200]; 13. W20-Greg Wilson [$1,100]; 14. 5J-Jeremy Schultz [$1,050]; 15. 64-Scotty Thiel [$1,000]; 16. O2-Mike Reinke [$900]; 17. 4B-Scott Biertzer [$800]; 18. 41-Jason Johnson [$800]; 19. 49-Brad Sweet [$800]; 20. 73-Ben Schmidt [$800]; 21. 23B-Russell Borland [$800]; 22. 50-Russ Egan [$800]; 23. 14AJ-Wayne Modjeski [$800]; 24. 2W-Scotty Neitzel [$800]. Lap Leaders: Daryn Pittman 1-2, Bill Balog 3-40. KSE Hard Charger Award: 15-Donny Schatz [+11]. Last Chance Showdown - (12 Laps - Top 6 finishers transfer to the A-feature) - 1. 73-Ben Schmidt [-]; 2. 14AJ-Wayne Modjeski [-]; 3. 23B-Russell Borland [-]; 4. 2W-Scotty Neitzel [-]; 5. 64-Scotty Thiel [-]; 6. 50-Russ Egan [-]; 7. 12W-Josh Walter [$300]; 8. 23D-Trey Datweiler [$250]; 9. 13-Clyde Knipp [$225]; 10. 94R-Robbie Pribnow [$200].